When Amanda came back from a harvest adventure with ripe wild Sierra gooseberries, she ended up making a gooseberry syrup. Besides their antioxidants, gooseberries have an amazing amount of pectin. It seems that gooseberries can be added to low-pectin fruit to make a nice jam without the addition of commercial pectins. I was all about the pectin until I tasted a truly ripe berry for the first time. Yes, I had tasted those plump green gooseberries that come in large cans. Pretty nondescript! I had also tasted some berries earlier in the season. Lots of pectin, but also nondescript. Then I sampled Amanda’s RIPE gooseberry syrup, and sampled again, and again. The flavor was unique, musky, earthy. The color was jewel-toned. Had these lovely berries been growing on the mountain above us for the last 30+ years without my discovering their enchanting possibilities? Amanda froze the syrup in ice cube trays to save for later. Fortunately, there was still of cup of syrup left when the trays were full. I claimed the cup for recipe trials and stashed it in the refrigerator while I decided what to do next. The flavor of a ripe gooseberry is subtle but distinct, deserving the right to sing a solo, or almost solo. So here was a pint jar holding one cup of syrup that was singing its heart out. “Easy!”, I thought, and added 3/4 cup of heavy cream. A quick stirring and tasting proved the mixture to be sweet, not too sweet, and luscious with berry flavor. 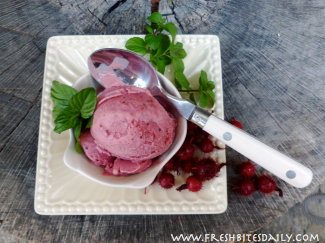 After adding two tablespoon of my fermented plum brandy to aid in the texture of the ice cream, I poured the mixture into our little electric ice cream maker and gave it a run. 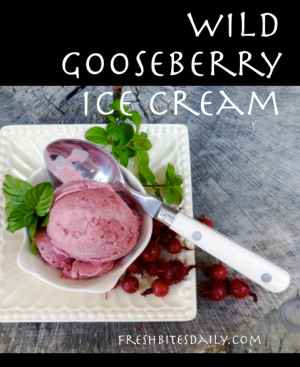 It didn’t take long for the ice cream to form up since both the berry syrup and the cream were cold when initially mixed together. The resulting ice cream is quite rich, as you can imagine. A small scoop of it is very satisfying. Try serving it in tiny bowls with crisp little shortbread cookies or use it as a topping for fresh fruit instead of whipped cream. Add the ingredients to the bowl of your ice cream maker and follow the manufacturer’s instruction for running it. When the ice cream has formed, transfer it to a freezer container and freeze for at least 4 hours before serving. If your ice cream has been frozen for much longer than that, you will need to remove it from the freezer prior to serving in order to soften it a bit.